Popular historic sites such as Shrine of Remembrance and Old Melbourne Gaol are in your itinerary. Museum-lovers will appreciate Melbourne Museum and National Gallery of Victoria. And it doesn't end there: admire the natural beauty at Royal Botanic Gardens, don't miss a visit to Flinders Street Station, admire nature's wide array of creatures at Melbourne Zoo, and take in the spiritual surroundings of St. Patrick's Cathedral. To see more things to do, photos, traveler tips, and more tourist information, use the Melbourne sightseeing planning site . Use the Route module to find travel options from your starting location to Melbourne. April in Melbourne sees daily highs of 23°C and lows of 11°C at night. Cap off your sightseeing on the 6th (Sat) early enough to travel to Gold Coast. 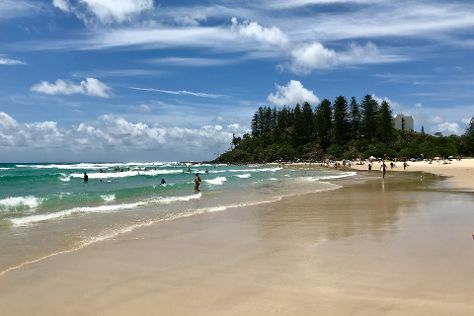 Kick off your visit on the 7th (Sun): explore the striking landscape of Burleigh Head National Park, then kick back and relax at Coolangatta Beach, and then enjoy the sand and surf at Kirra Beach. On the 8th (Mon), you'll have a packed day of sightseeing: enjoy the sand and surf at Tugun Beach, then enjoy the sand and surf at Burleigh Heads Beach, and then try for a hole-in-one at Putt Putt Mermaid Beach. To see more things to do, maps, traveler tips, and more tourist information, use the Gold Coast attractions planner . Traveling by flight from Melbourne to Gold Coast takes 4.5 hours. Alternatively, you can do a combination of flight and train; or drive. Plan for a bit warmer temperatures traveling from Melbourne in April, with highs in Gold Coast at 30°C and lows at 19°C. Wrap up your sightseeing on the 8th (Mon) to allow time to drive to Mooloolaba. Start off your visit on the 9th (Tue): view the masterpieces at Atrium Gallery at Buderim Craft Cottage, then tour the pleasant surroundings at Kings Beach, then enjoy the sea views from Caloundra Lighthouses, and finally enjoy the sand and surf at Mooloolaba Beach. To see traveler tips, where to stay, other places to visit, and tourist information, use the Mooloolaba trip planning site . Getting from Gold Coast to Mooloolaba by car takes about 2 hours. Other options: take a bus; or do a combination of train and bus. In April, daily temperatures in Mooloolaba can reach 30°C, while at night they dip to 19°C. Finish your sightseeing early on the 9th (Tue) so you can travel to Longreach. Longreach is a town in Central West Queensland, Australia approximately 700km from the coast, west of Rockhampton. On the 10th (Wed), see the interesting displays at QANTAS Founders Museum, see the interesting displays at Australian Stockman's Hall of Fame and Outback Heritage Centre, then stop by Spinifex Collections, and finally get a taste of the local shopping with Outback Pics. To find more things to do, traveler tips, photos, and more tourist information, read Longreach trip builder tool . You can do a combination of bus, train, and flight from Mooloolaba to Longreach in 6.5 hours. Other options are to drive; or take a bus. When traveling from Mooloolaba in April, plan for somewhat warmer days and about the same nights in Longreach: temperatures range from 37°C by day to 20°C at night. Wrap up your sightseeing on the 10th (Wed) to allow time to travel to Port Douglas. Kick off your visit on the 11th (Thu): discover the deep blue sea with a scuba or snorkeling tour. Get ready for a full day of sightseeing on the 12th (Fri): look for all kinds of wild species at Agincourt Reef, then stroll through Wildlife Habitat Port Douglas, and then relax and rejuvenate at some of the top local wellness centers. Use Inspirock's suggestions to plan your Port Douglas trip and find the best activities and attractions for your vacation. Do a combination of flight and shuttle from Longreach to Port Douglas in 8.5 hours. Alternatively, you can drive; or do a combination of bus and shuttle. Plan for a bit warmer nights when traveling from Longreach in April since evenings lows in Port Douglas dip to 25°C. Finish your sightseeing early on the 12th (Fri) to allow enough time to drive to Cairns. Kids will enjoy Trinity Beach and Scuba & Snorkeling. You'll explore the less-touristy side of things at Historic Village Herberton and Atherton Tablelands. Step out of Cairns to go to Kuranda and see Australian Butterfly Sanctuary, which is approximately 36 minutes away. There's more to do: step off the mainland to explore Michaelmas Cay. To see reviews, maps, and tourist information, you can read our Cairns trip builder site . Traveling by car from Port Douglas to Cairns takes 1.5 hours. Alternatively, you can take a shuttle; or do a combination of shuttle and bus. In April, daytime highs in Cairns are 34°C, while nighttime lows are 26°C. Cap off your sightseeing on the 15th (Mon) early enough to travel back home.